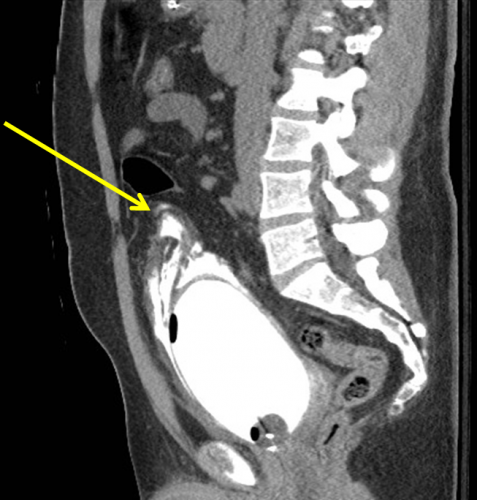 Extraperitoneal bladder rupture is a relatively uncommon injury, but is easily managed in most cases. It is associated with a blunt mechanism, and concomitant fracture of the pubic rami or spreading of the symphysis pubis is nearly always present. In the old days, we used to think that the bladder injury was due to penetration anteriorly by bony fragments, but this is probably an old wives tale. It’s more likely due to hydraulic forces occurring within the bladder at the same time the pelvic ring is being deformed or spread apart by blunt forces. If you obtain a pelvic x-ray during the initial trauma evaluation and see any fractures or diastasis around the symphysis, think bladder injury. Placement of a urinary catheter will typically drain plenty of urine, which will usually be grossly bloody. Once the injury is suspected, the diagnostic test of choice is a CT cystogram. Don’t confuse this with the images seen when the bladder passively fills with contrast when the catheter is clamped. There is not enough pressure in the bladder to guarantee that contrast will leak out, so this type of study may be falsely negative. True CT cystogram technique requires filling the bladder with at least 350cc of dilute contrast under pressure by hanging it on an IV pole, then clamping the catheter. 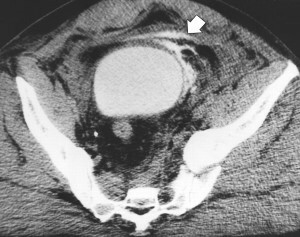 Once the bladder is filled, the scan can proceed as usual. But after it is complete, a second limited scan through the pelvis must be performed after the contrast has been evacuated by unclamping the catheter. This allows visualization of small contrast leaks that might otherwise be masked by all the contrast in the bladder. Note how the contrast dissects around the bladder but does not enter the peritoneal cavity. Extraperitoneal injuries usually do not require repair and will heal on their own. However, if the symphysis pubis needs instrumentation to restore anatomic position, concomitant repair of the bladder is frequently necessary to keep the hardware from being contaminated by urine. Suspect an extraperitoneal bladder injury in anyone with bony injuries involving the symphysis pubis. Don’t order a urinalysis in trauma patients! Use CT cystogram technique to make the diagnosis. Treatment is simple: leave the urinary catheter in place for 10 days. No urology consult is needed. Then repeat the CT cystogram to confirm healing, and remove the catheter. Bladder injury after blunt trauma is relatively uncommon, but needs to be identified promptly. 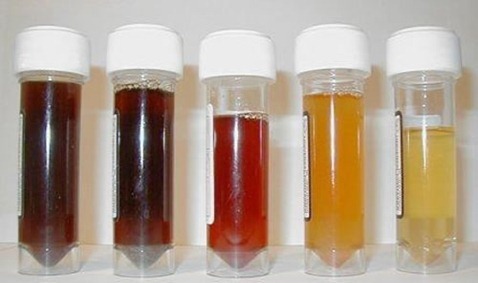 Nearly every patient (97%+) with a bladder injury will have hematuria that is visible to the naked eye. This should prompt the trauma professional to obtain a CT of the abdomen/pelvis and a CT cystogram. The CT of the abdomen and pelvis will identify any renal or ureteral (extremely rare!) source for the hematuria. The CT cystogram will demonstrate a bladder injury, but only if done properly! During most trauma CT scanning of the abdomen and pelvis, the bladder is allowed to passively fill, either by having no urinary catheter and having the patient hold it, or by clamping the catheter if it is present. Unfortunately, this does not provide enough pressure to demonstrate small intraperitoneal bladder injuries and most extraperitoneal injuries. The proper technique involves infusing contrast into the bladder through a urinary catheter. At least 350cc of dilute contrast solution must be instilled for proper distension and accurate diagnosis. This can be done prior to the abdominal scan. Once the initial scan has been obtained, the bladder must be emptied and a focused scan of just the bladder should be performed (post-void images). Several papers have shown that this technique is as accurate as conventional retrograde cystography, with 100% sensitivity and specificity for intraperitoneal ruptures. The sensitivity for extraperitoneal injury was slightly less at 93%. Bottom line: Gross hematuria equals CT of the abdomen/pelvis and a proper CT cystogram, as described above. Don’t try to cheat and passively fill the bladder. You will miss about half of these injuries! Reference: CT cystography with multiplanar reformation for suspected bladder rupture: experience in 234 cases. Am J Roentgenol 187(5):1296-302, 2006. I’ve previously written about management of extraperitoneal bladder injuries. One of the tenets is that every injury needs to have a routine followup cystogram to ensure healing and allow removal of any bladder catheter. I routinely like to question dogma, so I asked myself, is this really necessary? A retrospective registry review from the Ryder trauma center in Miami helped to answer this question. Over 20,000 records were screened for bladder injury and 87 were found in living patients. Fifty were intraperitoneal injuries, and half of them were caused by pelvic fractures (interesting). All were operated on, and 47 were classified as simple (dome disruption or through and through penetrating) and 3 were “complex” (involving trigone). All trackable patients (42 of the 50) had followup cystograms 9-16 days later. All of the simple injuries had a normal followup exam, but a leak was detected on one of the complex injuries. There were 42 patients with extraperitoneal bladder injuries. All were due to blunt trauma, and 92% were associated with pelvic fractures. Most were found with CT cystogram. Two patients had operative repair, probably due to the need to fix the pubic bones with hardware. 37 of the 42 were available for followup, and 22% of repeat cystograms were positive (average study done on day 9). In the studies that showed a leak, repeat cystograms were done, and they took an average of 47 days to fully heal. Bottom line: Patients with extraperitoneal or complex intraperitoneal bladder injuries (trigone) really do need a followup cystogram before removing the bladder catheter. Those who underwent a simple repair of their intraperitoneal injury do not. Reference: Cystogram follow-up in the management of traumatic bladder disruption. J Trauma 60(1):23-28, 2006.